CAOS organizes scientific events for universities and associations for many years. With our own registration and abstract handling programme, we can assist programme committees in organizing the content of their events. We help them find the right (keynote) speakers and are creative in thinking of new presentation techniques or work forms. 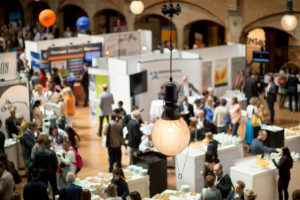 Moreover, to ensure a financially healthy event and create a bridge between research and the industry, we can advise on how to attract partners to the events. An example of one of our scientific events is the 33rd International Symposium on Microscale Separations and Bioanalysis (MSB). The University of Amsterdam approached CAOS to organize this event. They had one special request: to attract more young delegates to the conference. We came with the idea to organize a Young Scientist Award. This way, young researches were motivated to send in an application and attend the conference. In addition to the award, we asked students of the University of Amsterdam to help with various tasks onsite. These students helped filling the conference bags, collecting delegates at the station, and assisted the speakers with the setup of their presentations. In return, the students were offered free entry to the scientific programme of the conference and accomodation in the conference hotel. – all communication with delegates and speakers.